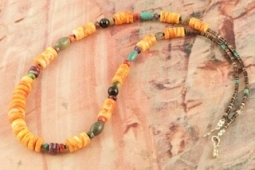 Beautiful Necklace featuring Genuine Spiny Oyster Shell Heishi Beads Accented with Genuine Gemstones and Pen Shell Heishi. Sterling Silver Clasp. The Heishi beads must be cut, drilled and ground by hand. This is a painstaking process: a single necklace may require the fashioning of hundreds of tiny beads. Created by Zuni Artist Emory Calabaza. The beads graduate from 3/8" to 1/8".